Tyrone's Mattie Donnelly with Roscommon's Niall Kilroy. ©INPHO/Evan Logan. There was high drama in Dr Hyde Park, where Roscommon and Tyrone could not be separated, registering 1-10 apiece. With 10,500 in attendance, Anthony Cunningham’s men looked set for a second successive victory when Ultan Harney netted eight minutes after the restart to hand them a seven-point advantage. But Tyrone struck an unanswered 1-4 – the goal coming from Cathal McShane and goalkeeper Niall Morgan supplying three points – to claim their first point of the campaign. The hosts again looked set for success when they were awarded a free in front of the posts five minutes into injury time but the referee stripped them of the opportunity due to retaliation, much to the disgruntlement of the vociferous home support. 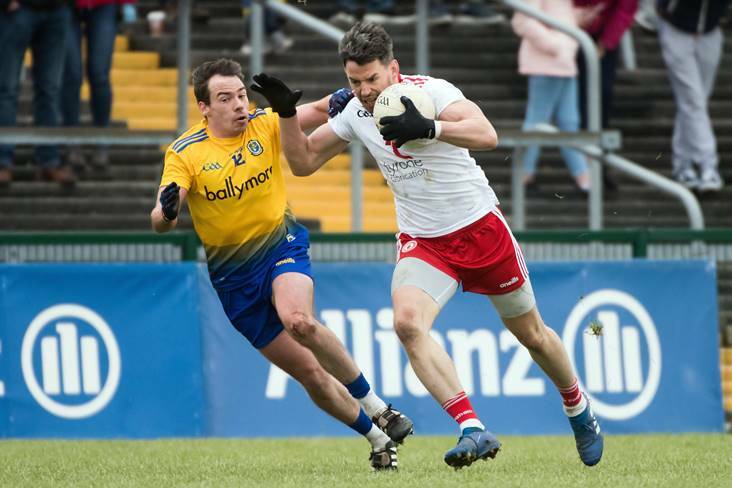 A run of seven unanswered points between the 20th and 33rd minutes had the rampant Rossies ahead by ten points to four at the interval, but Mickey Harte’s men would have the backing of a firm breeze when the action resumed. Conor Cox’ point sent Roscommon ahead by the odd point from five at the end of the first quarter, defenders Peter Harte and Conor Daly having traded the first two scores before Harte’s second converted free cancelled out Cox’ first point of the day. Full back Ronan McNamee fisted the Red Hands’ third point but Shane Kiloran restored Roscommon’s lead after Donie Smith’s goal effort rebounded back unluckily off the post. Cox and Kiloran pointed to make it double scores with ten minutes left before the break, 0-6 to 0-3, and it was a procession in favour of the wind-assisted home team as Harney, Smith, Niall Kilroy and Ronan Daly stretched their lead to seven, a third Harte free flying between the posts before the short whistle. A brace of Harte frees brought the border county back within four but they were knocked back when Harney got on the end of a Cox delivery and redirected the ball to their net with his fist, the Rossies' only second-half score arriving in the 43rd minute to make it 1-10 to 0-6. Morgan replied from a free and the match exploded to life 20 minutes from the end when McShane fisted to the net to reduce the arrears to just three points. Darren McCurry made it a two-point game with 56 minutes played and nerves they did jangle when Morgan boomed over a long-range free with five minutes left. Incredibly, two minutes later, Morgan equalised as he thumped over a point from play for the second weekend running! Reduced to 14 men for the closing stages after Mattie Donnelly was black-carded, the Red Hands poured forward looking for a late winner but Roscommon caught them on the counter and were awarded a free in front of the posts, only for the decision to be overturned and the ball to be thrown up instead. Roscommon - D O'Malley; D Murray, C Daly (0-1), E McGrath; C Devaney, C Hussey, R Daly (0-1); T O'Rourke, E Smith; S Killoran (0-2), U Harney (1-1), N Kilroy (0-1); C Cox (0-3), D Smith (0-1), C Cregg. Subs: C Compton for C Cregg, G Patterson for N Kilroy, H Darcy for C Hussey, A Lyons for C Cox. Tyrone - N Morgan (0-3, 2f); R Brennan, R McNamee (0-1), C McLaughlin, T McCann, B McDonnell, M McKernan; B Kennedy, P Hampsey; M Donnelly, N Sludden, P Harte (0-5f); D McCurry (0-1), C McShane (1-0), K McGeary. Subs: C Meyler for C McLaughlin, H P McGeary for R McNamee, K Coney for N Sludden, H Loughran for B McDonnell, F Burns for R Brennan.